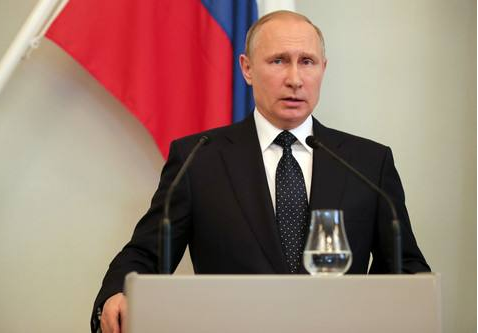 The Russian leader spoke in Moscow on Monday, one day after he was elected to a fourth term as president. "Nobody plans to accelerate an arms race," he said. Putin added that he would do everything he could to settle differences with other countries. "We will do everything possible to resolve all the differences with our partners using political and diplomatic channels," he said. His comments mark a change from some of his recent statements. During the election campaign, Putin talked about new nuclear weapons he claimed could strike almost anywhere in the world. His election win came as the British government accuses Russia of poisoning a former Russian spy living in Britain. The man, Sergei Skripal, and his daughter Yulia are listed in critical condition at a English hospital. British Foreign Minister Boris Johnson spoke to European Union ministers in Brussels Monday. Johnson said Russia's continued denial of involvement in the poisoning was growing, in his words, "absurd." He added that "technical experts" from the Organization for the Prohibition of Chemical Weapons plan to study samples of the suspected nerve agent. The apparent poisoning of Skripal and his daughter has led to a diplomatic dispute between the two countries. Last week, Britain expelled 23 Russian diplomats over the incident, causing Russia to answer by expelling an equal number of British officials. British lawmakers are urging Prime Minister Theresa May to seize the assets of wealthy Russians with ties to Vladimir Putin. European group says election not "competitive"
The Reuters news agency described the vote on Sunday as Putin's biggest ever election victory. He defeated seven other candidates to win re-election. The Organization for Security and Cooperation in Europe said the election lacked "genuine competition." Putin received more than 76 percent of the votes. The second-place candidate received almost 12 percent of the vote. Well-known opposition leader Alexei Navalny was barred from running as a candidate. The Russian government had sought to get 70 percent of registered voters to mark ballots in the election. A little less that 68 percent actually voted. Several world leaders called Putin to congratulate him on his victory. The callers included China's president, Xi Jinping. French President Emmanuel Macron also spoke with the Russian leader. Agence France Presse reported that Macron wished him "success for the political, democratic, economic and social modernization" of Russia. He also pressed Putin to provide information about the poisoning dispute with Britain. Putin also received a call from German Chancellor Angela Merkel, who noted "challenges" in the countries' relationship. He also heard from Japanese Prime Minister Shinzo Abe. Abe called for close cooperation in reaching an agreement to end North Korea's nuclear activities. After his victory, Putin said he wanted to reduce spending on Russia's defenses. He said he wanted to direct his attention to raising the quality of life of average citizens and investing more in education, healthcare and public services. A number of Western nations have approved economic actions against Russia for taking Crimea from Ukraine and continued Russian involvement in that country. The international community also has criticized Russia for its support of Syrian President Bashar al Assad, most recently for continuing violence near the Syrian capital Damascus. Last week, the United States Treasury Department announced sanctions against five Russian groups and 19 individuals for interfering in the 2016 U.S. presidential election. U.S. officials say Russian organizations and individuals sought to divide Americans with false or misleading news stories during the election campaign. Putin's reelection would keep him as Russia's president until the year 2024. The former intelligence officer has been either president or prime minister of the Russian Federation since 2000. He took power in 1999 after Boris Yeltsin resigned as president. The missile-reduction treaty makes sweeping cuts, but the arms race isn't over by a long shot. The Prime Minister was speaking ahead of today's meeting. He said all of iran's nuclear activities are transparent. 5. "We will do everything possible to resolve all the differences with our partners using political and diplomatic channels," he said. We must do everything possible to lift the siege. We'll do everything possible to finish it on time. 6.He took power in 1999 after Boris Yeltsin resigned as president. He took power by lawful means.